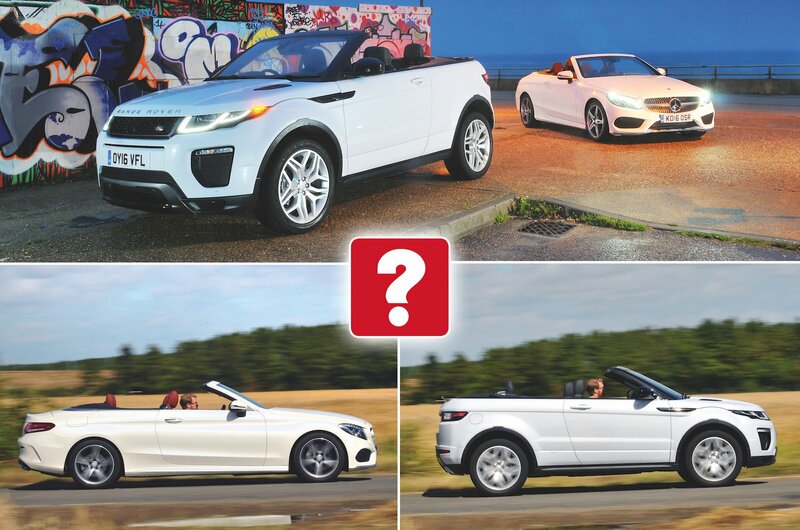 Used test: Mercedes-Benz C-Class Cabriolet vs Range Rover Evoque Convertible | What Car? The four-seat C-Class Cabriolet is based on the sharply styled Coupé. The Evoque soft-top SUV is unique in its class, but does it have the substance to back up those head-turning looks? They say the best time to buy a convertible car is in the winter, as the demand for them drops off at this time of year. That’s not a bad idea. After all, we Brits love a convertible. Although our summers often feel more like a monsoon season, we’re actually Europe’s second-biggest market for drop-tops, which means the two used car protagonists we’ve lined up here may well pique your interest. 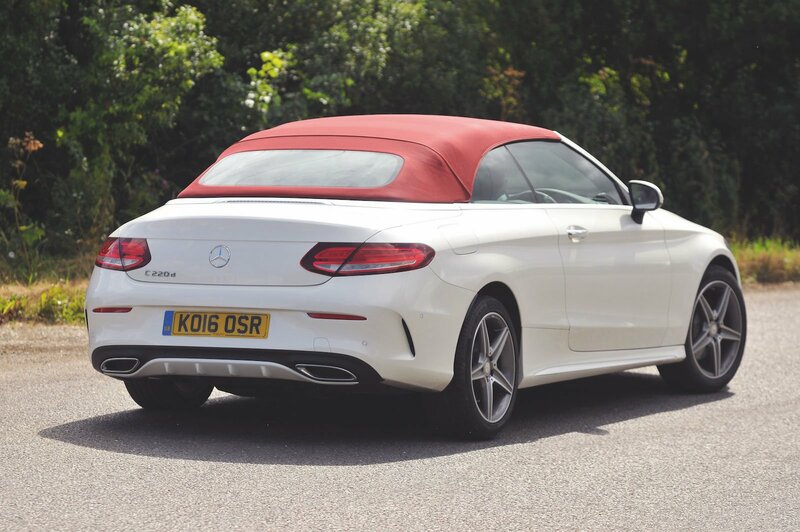 The first is the Mercedes C-Class Cabriolet – a conventional four-seater based on the elegant C-Class Coupé. We’ve chosen the entry-level diesel engine in sporty-looking AMG Line trim. Our second contender is rather less orthodox. In fact, as a drop-top version of the fashionable Range Rover Evoque, it’s still the only convertible SUV on the market. Is there a good reason for that? Or is Range Rover’s blue-sky thinking a stroke of genius? Buy either of these two cars at two-years-old and you can also make a significant saving on the price of both of them when they were new. But which one would suit you best? Read on to find out. The Evoque may have a slightly more powerful engine, but it’s weighed down by an extra 200kg of flab. While the C-Class builds speed fairly briskly, acceleration in the Evoque is adequate at best – even if you put your foot down hard. Both engines are a bit clattery at idle and when worked hard, but the C-Class’s isolates you better from vibration. Through the corners, the Evoque leans more and is less keen to change direction. Its steering is also unnervingly quick for a car so tall, making it feel relatively unstable. The C-Class has slower steering, so feels less hyperactive, and its steering weight builds more naturally as you turn in to corners. While outright stopping distances from 70-0mph were similar in our tests, the Evoque nosedives heavily, so it feels less stable under braking. 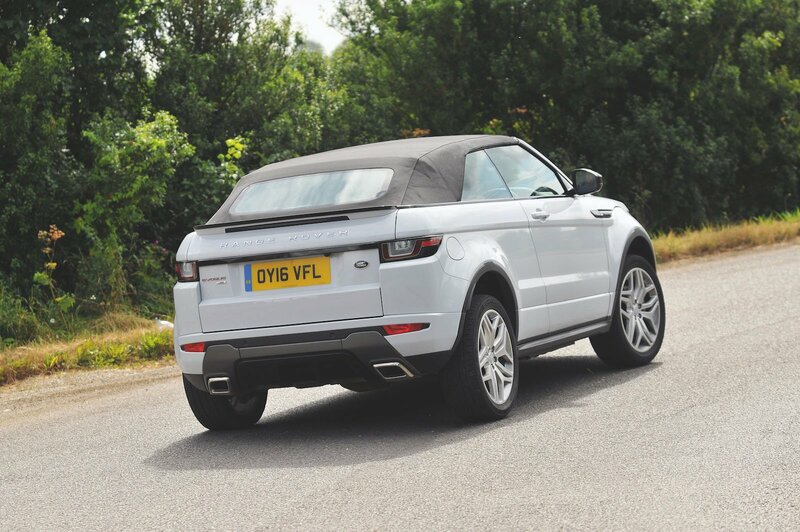 At cruising speeds, the Evoque rides most bumps better than the more firmly sprung C-Class. However, the Evoque’s lofty seating position amplifies the car’s body movements, so your head gets tossed from side to side along pockmarked urban streets, which is actually more annoying. In the C-Class, you can enjoy a much smoother ride if you find one that has the optional Airmatic suspension fitted. Neither car feels as stiff as the hard-top on which it’s based. The Evoque’s body shimmies a little along rough roads while the C-Class is floppier still, sending shudders through the steering column whenever you encounter a nasty pothole. The optional Airmatic suspension makes the flex in the body less apparent, though. The Evoque comes with an eight-speed automatic gearbox that is smooth and responsive on the move. However, there’s always a noticeable pause when accelerating from a standstill. This makes entering a busy roundabout more stressful than it should be. A six-speed manual gearbox is standard on the C-Class, but our test car came with the optional nine-speed automatic most buyers opt for. Left in Normal mode, it’s just as smooth as the Evoque’s, although switch to Sport and there’s a more noticeable jolt when upshifting. The Mercedes’extra gear means its engine spins away slower at speed, making it the quieter cruiser. 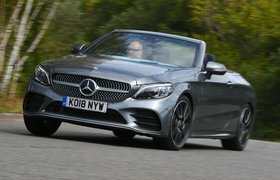 You can hold a conversation at 70mph with the roof down in both cars, although the C-Class is marginally quieter inside. It comes with an electrically operated wind deflector as standard, whereas the Evoque’s is an expensive option that needs to be manually put up and blocks off the rear seats. Both roofs can be operated at up to 30mph, but the Evoque’s is around six seconds quicker to go about its business.